The wait is over and now baseball (or at least baseball that counts) is back! The Padres set their 25-man roster a couple days ago, placing Mark Kotsay and Carlos Quentin on the DL and adding Jeremy Hermida, and then re-set it today by placing Tim Stauffer on the DL and adding reliever Brad Brach. Brach is one of six players making his first appearance on an Opening Day roster, joining Anthony Bass, Andy Parrino, Jesus Guzman, Yonder Alonso and Logan Forsythe (he’s on the DL, but it still counts). The Friars’ Opening Day roster consists of 12 pitchers (nine right-handed and three left-handed), two catchers, six infielders and five outfielders. Edinson Volquez is slated to make his second career (and second consecutive) Opening Day start this afternoon. The rotation following him will be Cory Luebke, Dustin Moseley and Clayton Richard. Can’t wait!! Finally Opening Day again. Can’t wait to see the Padres win the NL West. Lets keep the great Spring moving into and through the regular season. Go PADRES!!!! 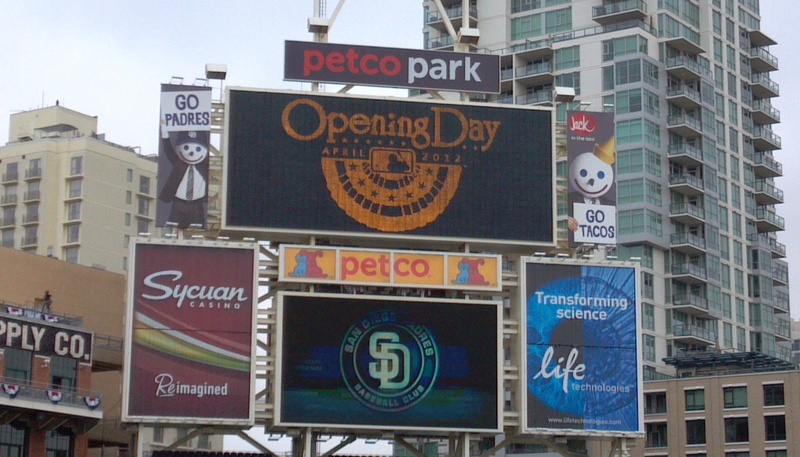 Let’s go Padres! Once again I am extremely excited for Opening Day. Excited to see the Padres young and old talent win the NL West this year. Good luck! Lets keep that spring training roll going through the regular season and into the playoffs.